The Patches lie at the far end of the settlement plain from the village, separated by Hillpiece. This is where islanders grow their potato crop and spend weekends in camping huts. This view from the edge of The Base, looks north along Tristan's most extensive plain - some 4kms in length and up to 1km wide. 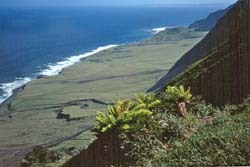 The grassy plain slopes from the base of the steep former sea cliffs, to low modern cliffs above black sand beaches. The plain is crossed by normally dry river beds called 'gulches' marked by boulder-strewn courses marking where streams flow during heavy rain. The volcanic cone of Hillpiece can be seen at the far end of the Patches Plain. Enjoying a sheltered situation in the lee of one of the Patches Plain's small volcanic cones called 'hornitos', this camping hut is also handy for Runaway Beach which offers the best rock pool swims (Islanders never swim in the open sea due to sharks and currents). 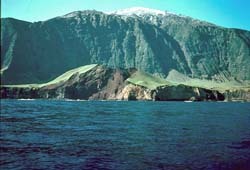 Inaccessible Island, 40 km south-west is clearly visible from The Patches Plain. Viewed from high on the cliffs above Hillpiece, Tristan's Potato Patches dominate the north end of the plain. Also visible are dozens of buildings, huts to store tools and seed potatoes (though they need to be well protected against rats and may be brought back to more secure Settlement storage) and also 'camping huts' providing beds, stoves, chairs and tables for a weekend away from the Settlement. 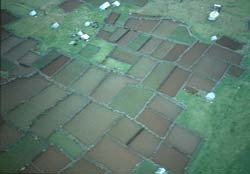 Tristan's Potato Patches are a series of rectilinear walled fields, normally without gates, where potatoes and other vegetables have been grown for over 150 years. The tiny fields offer shelter from gale force winds on this exposed part of the island. Every island family owns and cultivates several patches and all help to plant, tend and harvest crops. The massive 1000 metre high former sea cliffs rising behind Burntwood are the highest on Tristan as they were exposed to the prevailing North-West winds. 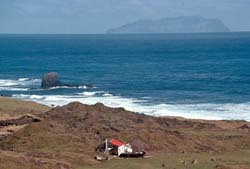 Hillpiece is a fairly young volcanic cone, its loose ash rock being quickly being eroded by South Atlantic breakers. Behind Hillpiece the island's 'main road' linking the Settlement (left and to the North) with the Patches Plain (right and to the South).